So near where I grew up in early seventies. From Heathrow airport at eleven fifteen sharp. Our baby daughter pointing up, saying "CO-cord". 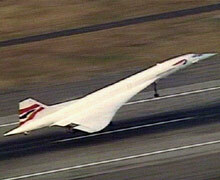 Will help Concorde's virtual flight last forever.